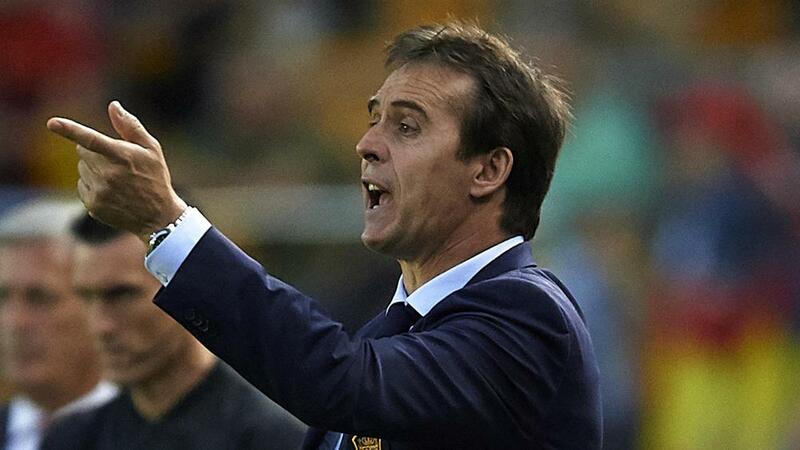 Julen Lopetegui claims Luis Rubiales was "the first person to know" about his appointment as Real Madrid's new head coach, and said he wished the president of Spanish football's governing body had not sacked him from the national team. The former Porto boss was dismissed on Wednesday – just two days before Spain's first World Cup match against Portugal – following Tuesday's announcement that he was to take charge at Santiago Bernabeu, replacing Zinedine Zidane. Rubiales said the sacking could have been avoided if full discussions had taken place between the club and the Royal Spanish Football Federation (RFEF) before the news about Lopetegui's move to Madrid was made public. Speaking at his presentation to the media, an emotional Lopetegui said he made efforts to ensure the RFEF was informed of the agreement, which was intended to take him to Madrid after Spain's World Cup campaign. "When there was something to know, he [Rubiales] was the first person to know," said Lopetegui. "We just wanted to be honest with everyone – that's why we wanted to make the agreement public. Hiding it would have been bad. "You can't turn back time but we're convinced that what we've done is honest and clear." Asked if he would change anything about the way the announcement was made, Lopetegui said: "I would change the reaction, hours later, from Rubiales - but you can't change that." Madrid president Florentino Perez suggested the club intended to unveil former goalkeeper Lopetegui after the World Cup, only to be forced into announcing his appointment prior to the start of the tournament in Russia. Perez referred to Lopetegui's arrival as "an act we wanted to have after the World Cup", saying: "Sadly some circumstances mean that we are here now with some excitement for the new stage of Real Madrid. "We welcome someone who knows this club very well and in the last few years he has shown what a magnificent professional he is. "He has the responsibility of leading a legendary team that has won three Champions Leagues. He qualified the national team to the World Cup in Russia in a fantastic way – he did it unbeaten in 20 games as manager." "This is a day of a lot of emotions and feelings and in a certain way there are strange feelings because, Julen, you wanted to be world champion," Perez added, addressing Lopetegui directly. "You wanted to make Spain champions of the world and then manage your dear Real Madrid – that is coming true now. Fans are going to give you a lot of affection."